Let me get this out there before I continue with this post - I love EBO. Yes, I'm biased. There I said it. Why you might ask? Well, first of all, the food is good. Second, the dining space is both spacious and comfortable. 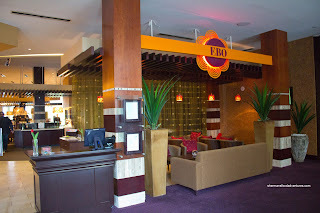 Third, they are extremely kid-friendly despite being located near a casino. Oh and lastly, it is located somewhat near where I live, so I really don't have to travel to eat there. So why has it taken me so long to eat there again? That's a good question. Maybe I should visit the place more often! Now for this lunch visit, it was with the in-laws (and yes, with my Mother-in-Law...). 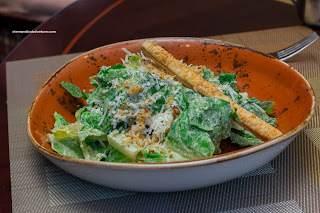 Maybe a visit to a non-Dim Sum environment, where it is quiet and classy, she might actually behave... At least that was my hope... Anyways, she started with a Caesar Salad with bacon crumbs, garlic & caper dressing and Grana Padano. It was pretty good with crunchy romaine and plenty of cheese. However, it was a tad over-dressed which made some parts soggy. My Father-in-Law went for the Seafood Chowder which was served table side. 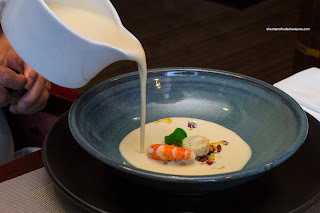 The pieces of seafood were well-prepared with the proper textures while the creamy soup was a touch salty. 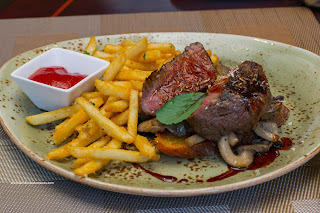 While we were seated, Executive Chef Dan Craig spotted us and proceeded to treat our table with 2 complimentary items. First up was the Local Mussels with leeks, tomato, saffron, gelderman bacon and grilled bread. 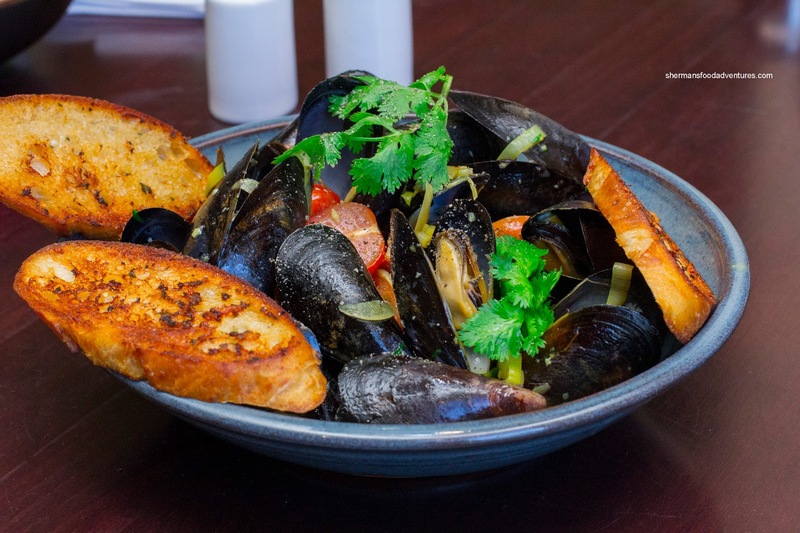 The mussels were buttery and just cooked while the broth had body in the form of salty bacon and the essence of saffron. The grilled bread was not just a bystander as it was crunchy and helped soak up the flavourful broth. 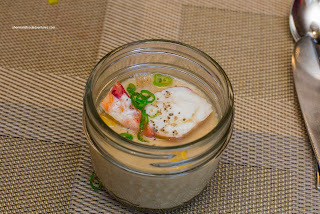 Next was the Lobster Custard that was an item they were planning to put on the regular menu. It was light, silky and full of lobster flavour. I liked how it wasn't salty where it let the natural flavours do the talking. The 2 pieces of lobster on top were buttery and prepared just right. For their mains, my in-laws both had the 6 oz Angus Sirloin with garlic and Parmesan frites, toasted garlic filone, seasonal mushrooms and horseradish. Both were prepared a nice medium-rare, however, my MIL claimed hers was more tender than my FIL's steak. 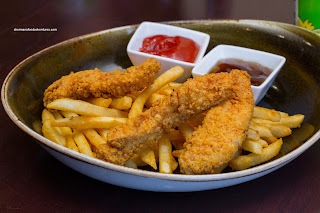 For the kiddies, they both had the Chicken Strips & Fries (kids under 6 eat free with adult meal) that was part of the kid's meals which include a drink and dessert. 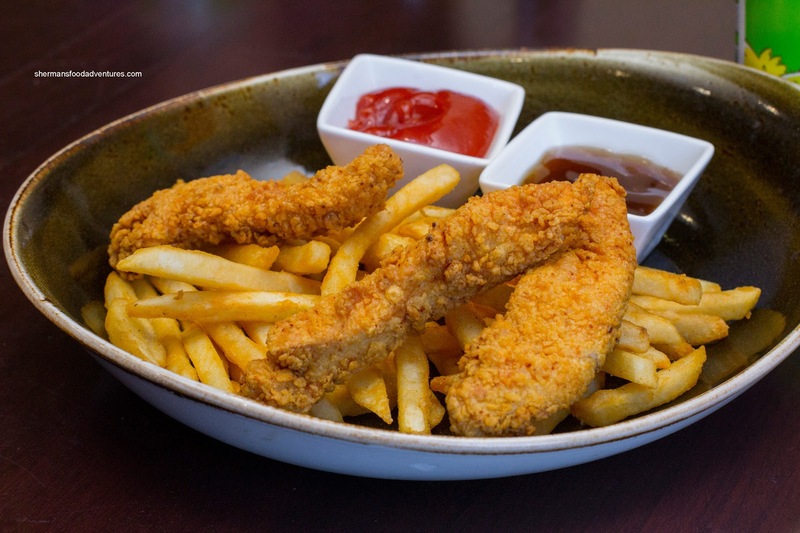 With house-made chicken strips consisting of breast meat and panko breading, these were a step above the generic kind. They were crunchy and still moist in the middle. 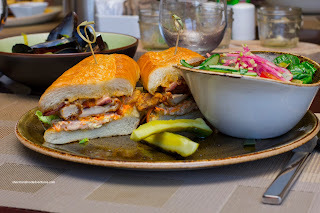 For Viv and myself, we shared 2 dishes including the BFC Crispy Chicken Po' Boy made with buttermilk fried organic Fraser Valley chicken thigh, Gelderman Farms smoked bacon, coleslaw, Swiss and spicy mayo. I really liked this sandwich as the chicken thigh was still moist while being super crunchy. The thick bacon had a hard crunch (which was good) and smokiness which added nice flavour to the already tasty chicken and spicy mayo. Moreover, the bread was toasted nicely while being soft at the same time. 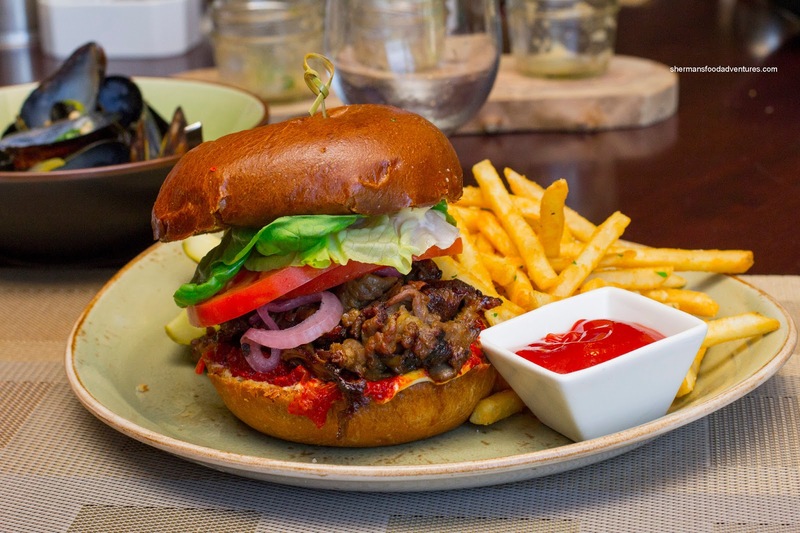 We also had the BBQ Beef Sandwich consisting of marinated sliced grilled Angus beef, grilled onions, house Kim Chi and tangy mayo on a brioche bun. The meat itself was easy to chew while exhibiting a nice smoky char. It was on the saltier side though. The kim chi offered up some spice and crunch while the onions were sweet. I really liked the brioche bun because it was not dry, but it did struggle with the moisture. 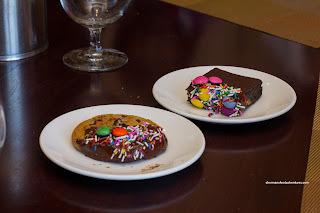 As part of the kid's meals, my kids got a Brownie and Chocolate Chip Cookie each. 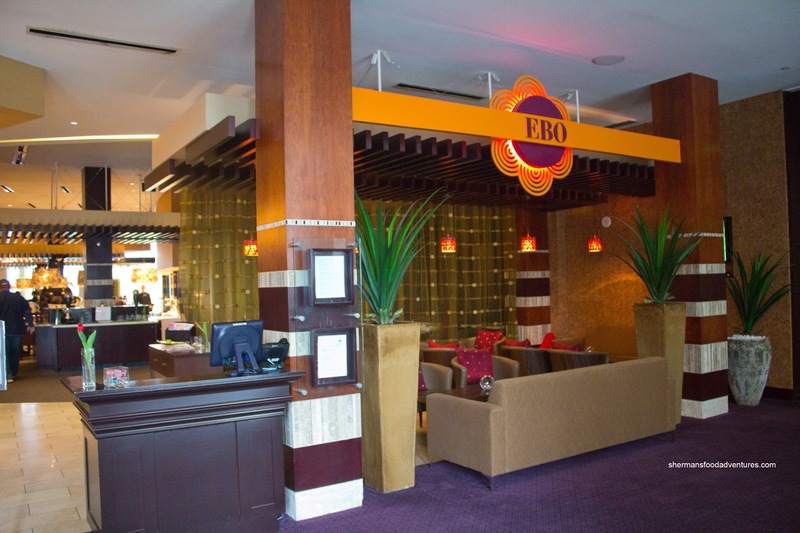 This further high-lights the hidden kid-friendliness of EBO, even though it looks pretty swank inside. Combined with good food, you can see why I am biased.